ABS-CBN's noontime show "It's Showtime" celebrates its 5th anniversary with 'Magpasikat' Week that runs from October 20-24, 2014. 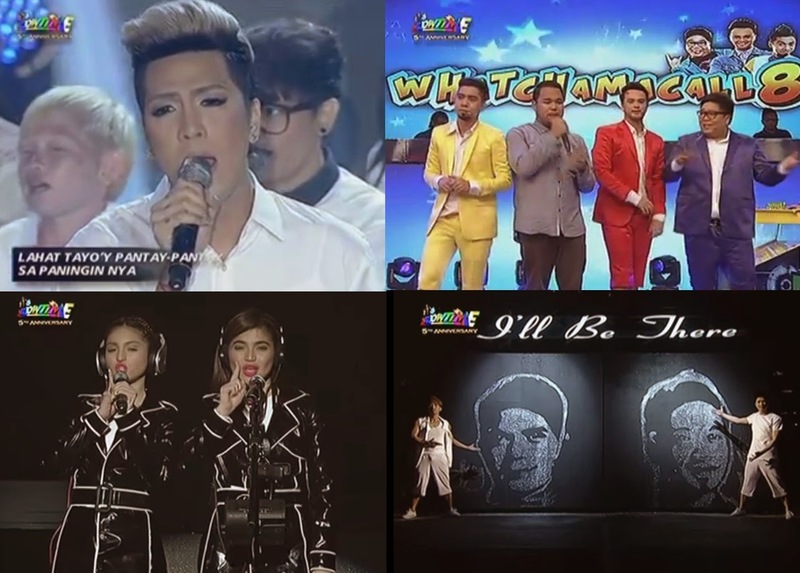 The 11 hosts of the trending program wowed the live audience and viewers on their performances. Video compilation is now available online. Karylle and Kuya Kim Atienza opened the 'Magpasikat' Week with the combined music, experiments, and a call for environmental awareness that they capped off with two surprises – an appearance from Mommy Dionisia Pacquaio and the announcement of a mobile app. Jhong Hilario and Vhong Navarro were joined by Yassi Pressman with the special appearance of Jericho Rosales for their special number. The highlight of their performance was a "speed painting" session using glue and glitter. In the end, it was revealed that Hilario painted the face of Navarro, who in turn drew Hilario's face. Anne Curtis and Coleen Garcia have played musical instruments such as the piano, xylophone and drums, then, the crowd went wild as they bravely performed aerial acrobatics. Judges Pops Fernandez, Jim Paredes and Cherie Gil admitted that they got scared, especially since the two actresses didn't use a rubber mat. It's Showtime's 'People' did not expect the performance of comedian Vice Ganda to bring them in tears. Vice and Ryan have performed song about equality because they wanted their number to be meaningful. Last but not the least on 'Magpasikat' Week was Team TBJ (Billy Crawford, Jugs Jugueta and Teddy Corpuz) who had something different in mind for their Magpasikat performance today. They created thir noontime show called "Whatchamacall8." The format had one audience member, picked at random, guessing words or phrases acted out by Crawford and celebrity guests Nadine Lustre and James Reid of the "Diary ng Panget" fame. Magpasikat Week is an annual tradition on "It's Showtime" where the winning team will donate the cash prize for their chosen charity. The grand winner will be announced on Saturday, October 25. Which team do you think will be declared champion of 'Magpasikat' Week 2014?